In March 2005, Missy had surgery to remove a GIST tumor in her abdomen. During this extensive surgery, oxygen and blood supply were cut off from her small bowel which in turn caused it to die. Because of this, Missy was placed on a transplant list as it was the only way for her survival. In July 2005, Missy was granted her first multi-visceral transplant. The first three weeks, things progressed beyond what was expected. Then, Missy started going into severe rejection. She went thru a couple of months of constant treatment and it was eventually decided to give her a second multi-visceral transplant, this time, including a liver as hers had overworked itself with the first transplant. In October 2005, a second, multi-visceral transplant (liver, stomach, duodenum, pancrease, small bowel) was given to her and has continued to be successful. Very few people in the world have been given two multi-visceral transplants. 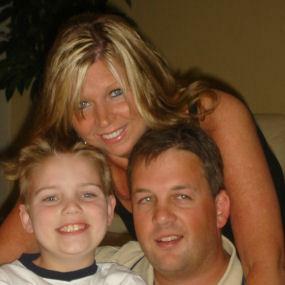 After severe pnemonia and a heart anurism in fall 2005, Missy had to learn to walk all over again and was finally released to go home in December 2005, thus being able to spend the holidays with her 8 year old son, fiance’, and family. In February 2006 her illeostomy was closed down. This entire experience has been an absolutel miracle of God! Missy is now (Summer 2006) recooperating and starting to do social things again, taking care of her son, lightly working out at her local gym, and hopes to go back to work very soon. Missy thanks you all for your generous contributions in assisting her with unincured medical/prescription expenses! Missy Tague is raising money to pay for uninsured medical expenses and prescriptions associated with her multi visceral transplant. Missy lives in Fishers, IN and is being treated at Indiana University Medical Center. Missy has chosen to fundraise with HelpHOPELive in part because HelpHOPELive provides both tax-deductibility and fiscal accountability to her contributors. Contributors can be sure that funds contributed will be used only to pay or reimburse medically-related expenses.For more information, please contact HelpHOPELive at 800-642-8399. To make a contribution to Missy?s fundraising campaign, click the ?contribute now? button below. To email this page directly to others in your community, who might wish to learn about Missy?s campaign, click the ?email? button and type in as many email addresses as you wish.